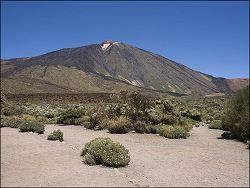 The Mount Teide National Park on the Canary Island of Tenerife, was declared a National Park in 1954 and is home to Spains highest mountain, Mount Teide, standing at 3,718m. 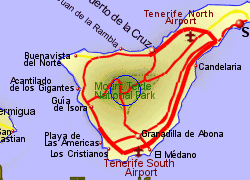 Mount Teide is also the highest of any Atlantic island and the worlds third largest volcano. 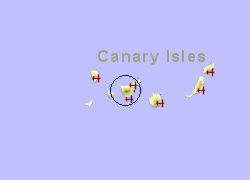 The volcano is currently dormant, having last erupted in 1909 but there are vents (fumaroles) releasing hot steam and sulphur dioxide, producing a yellow deposit of sulphur that remind you that you are infact on a volcano. 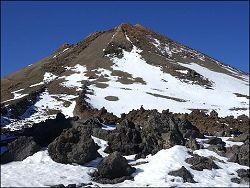 The peak rises out of a volcanic crater, 15 Km across, at an altitude of 2000m, an area that can be at 40deg C in the summer and could see snow in the winter. Public roads run in the volcanic crater, where you already feel to be in another world, and give access to the cable car which takes passengers to an altitude of 3,555 m, leaving a relatively easy (though you will notice the thin air at this altitude) climb/walk of 163m to the summit. 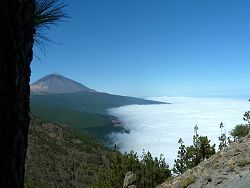 Access to the summit has however been restricted in recent years (a permit is required) due to the large number of visitors to the site. However there is an area at the top of the cable car where you can certainly take in the views and appreciate the thinness of the air. The more adventurous (and fit) can walk on the one route allowed from the level of the crater. 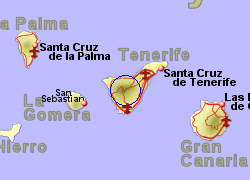 Map of the Mount Teide area.